There are statements that obviously that she has made that the president doesn't agree with, and that's probably true for a number of the people that the president is recognizing for their lifetime contributions. In this case, the adverb probably belongs earlier in the sentence ("There are obviously statements that she has made…"), and having stuck it in too late, Gibbs may just be using an extra that to fence it off from the rest of the subordinate clause. So he wins round one, but he didn't get the bipartisan support that clearly that he wanted. Shall the project managers have access to the files knowing that in most cases that they will mess up the drawings? You could substitute "…it's true in most cases that…", or something, but there's no simple lexically-related complement-taking alternative to "in most cases". I have unflattering thighs and thought that no way that I can fit in one… till the salesperson convinced me to just give it a try… and I did. No way (that) is often used as a short form of There's no way (that), though it can also be equivalent to in no way, as in "I can no way afford that", or Anne Bradstreet's famous line "Thy love is such I can no way repay". Do you ever get that feeling, though, that right when the proctor says "ok, pencils down and stop typing" that you missed something? That one is from the latest blog post ("Death to Dead Law", 12/9/2009) by Sharon Eliza Nichols, the author of I Judge You When You Use Poor Grammar, and the creator of the Facebook group by the same name, which currently has 415,529 members. As usual, the group's definition of "poor grammar" seems mostly to involve typographical errors, misspellings, and misuse of apostrophes, but there are also the expected peeves about vernacular morphology, clause-final prepositions, stigmatized word senses, and so on. I'm not sure whether Ms. Nichols' sentence involves bad grammar (that is, a compositional mistake), or new grammar (that is, a emergent construction like Isis), or what. But whatever is going on, it's apparently not the kind of thing that her group or her book is involved in analyzing, much less judging. And anyhow, in the company of Robert Gibbs, Anderson Cooper, and Lareece, she shouldn't worry too much about being judged. Are you sure that the transcripts aren't just on-the-fly rephrasings: "There are statements that obviously…that she has made that the president doesn't agree with." "he didn't get the bipartisan support that clearly…that he wanted." [(myl) Some spoken examples are indeed clearly self-corrections of this kind. Others don't really sound that way, though you can't always tell a fluent self-correction from correction-free fluency. The many written examples would have to be a different sort of compositional or editing error. intentional joke, or evidence of the contagion of this kind of structure? I thought LL did a posting on the "that…that" the way Nichols uses it a while back…actually, I guess Arnold Zwicky did, now that I read above. @John: If (some of) these are self-corrections, I'd think they're more likely to be adding the adverb than deleting it; e.g. correcting an initially planned "There are statements that she has made … " to "There are statements, obviously, that she has made … ". The adverbs add qualifications, attitudes, concessions, etc, which (aim to) make the resulting sentence more sophisticated and sensitive to the audience. Also, I suspect there isn't necesssarily a sharp line between error and new construction in this sort of case. It's in precisely the sort of case where it's easy for the speaker or listener to forget which of two related constructions is in use, that adding extra material is useful for clarity. Clearer to repeat material, than to risk leaving it out altogether in a moment of forgetfulness. 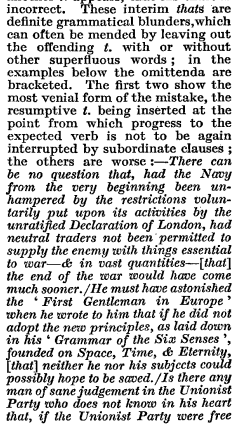 In some cases where it is typed the sentence might have been "VERB that SENTENCE", and the author meant to add the adverb as in "VERB that ADVERB SENTENCE", but left the original adverb in? In the first example, maybe the author was supposed to go from "There are statements that she has made" to "There are statements that obviously she has made". It's plausible for at least the first three examples. As for your last example, I'm not sure if it would sound so odd spoken, but the written punctuation makes it look odd. Maybe if it were written like this: "Do you ever get that feeling, though, that–right when the proctor says "ok, pencils down and stop typing"–that you missed something?" Where the second "that" is basically a signal that an interjection has finished. Yeah, this makes it clearer than ever that appositional adverbials are prosodically placed. In Ancient Greek there is an expression δῆλον ὅτι (delon hoti). This expression literally means "(it is) obvious that…", with the first word δῆλον being a neuter adjective meaning "obvious" and the second word ὅτι the conjunction "that", used much like in English to introduce certain subordinate clauses. So, presumably starting from the use of this phrase to introduce a subordinate clause, as time goes on δῆλον ὅτι comes to be used as an adverbial interjection. That is, you get sentences where δῆλον ὅτι is inserted in the middle, and is not, strictly speaking, introducing a subordinate clause (although in some cases the syntax can be read that way)–it's just an aside, equivalent to the adverb "obviously". This despite the fact that the neuter adjective δῆλον can already be used as an adverb meaning "obviously" by itself. So you have an adverb phrase meaning "obviously", the first word of which already means "obviously" by itself, with the word "that" stuck onto the end for no reason other than by analogy with situations where "it is obvious that" actually does introduce a clause. εἰ μέντοι ἀληθῶς, τοῦτο οὔπω οἶδα, ἀλλὰ σὺ δῆλον ὅτι ἐπεκδιδάξεις ὡς ἔστιν ἀληθῆ ἃ λέγεις. However, I don't yet know whether this is true, but you obviously (that) will explain how what you are saying is true. "It often happens to a writer to embark upon a substantival that-clause, to find that it is carrying him further than he reckoned, & to feel that the reader & he will be lost in a chartless sea unless they can get back to port & make a fresh start. His way of effecting this is to repeat his initial that. This relieves his own feeling of being lost; whether it helps the inattentive reader is doubtful; but it is not doubtful that it exasperates the attentive reader, who from the moment he saw that has been on the watch for the verb that it tells him to expect, & realizes suddenly, when another that appears, that his chart is incorrect." Does the Cupertino effect play any part? Does (or did) MS Word suggest the insertion of a second "that" in such sentences? It's interesting that this happens in a similar sort of context to the doubling up of 'is' in such phrases as 'The problem is is that…' which I'm hearing increasingly often from British speakers, and which has no doubt been discussed previously on LL. I'd assume that this construction originated in the conflation of the two more 'correct' constructions 'What the problem is is that…' and 'The problem is that…'; but is it perhaps another indication of disfluency as speakers summon up the whole content of the imminent 'that'-clause? @Nicholas: I'd suggest that the "is is" construction in your example might arise (at least sometimes) from vacillation about where to place a stress—that is, between "The problem (pause) is that … " and "The problem is (pause) that …". The result is a sentence with both a stressed is and a following unstressed is: "The problem is (pause) is that … "
Oops, I've just noticed myl's very own annotation to the first comment above, on precisely this 'Isis' question! However, I would like to add that something not entirely dissimilar seems to be happening with the absolute phrase 'the problem/reason/etc being that…', which is often transformed into the beginning of a completely new sentence: 'The reason being is that…'. This seems less a grammatical confusion than a reinterpretation of an absolute phrase (relatively uncommon in everyday spoken English) into something more familiar. @Tim. I think that that (!) certainly would account for some instances, though one of things that is striking about this construction is that (as myl pointed out in that post) it is often spoken with no pause or indication of disfluency. Na bībī, na baccā, na bāp baṛā, na māiṁyā; the whole thing is that ke, bhāiyā, sabse baṛā rupayā. "It’s not your wife, your child, your father, or your mother that’s important—the whole thing is that (that), brother, money’s greater than everything." @Nicholas: "Is is" is by no means limited to British speakers. For a prominent example, I've noticed that Barack Obama uses the construction quite consistently; Google [obama quote "is is that"] for a host of examples. I'm interested in the example "I thought that no way that I could fit in." As noted, "no way" is usually short for "there's no way," and I find that "I thought that there's no way that I could fit in" doesn't seem so bad. In fact, I'm not at all sure that that's the same that repeated — "I thought that" and "there's no way that" are both perfectly good phrases. [(myl) With respect, duh. The point of the discussion in the post was that if you take "no way" to be short for "there's no way", then the cited example is just a double embedding; but if you take "no way" to be short for "in no way", then the cited example involves an extra that. The hypothesis throughout the post is that this conceptual double life is also involved in the examples with sentence adverbs like obviously and apparently, where the pragmatic equivalents "it's obvious (that)", "it's apparent (that)", etc., would yield a syntactically normal double embedding. "With respect, duh." An oxymoron, no? Or a plain self-contradiction. [(myl) I meant it as a short form of "I don't mean to be rude, but you (i.e. 'Mr. 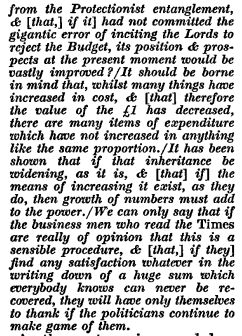 Punch') seem to have re-stated one of the main points of the post in the form of an objection." "So he wins round one, but he didn't get the bipartisan support that clearly that he wanted." "So he wins round one, but he didn't get the bipartisan support, that clearly, that he wanted." In other words, the support wasn't that clear.